CG Vyapam earlier in the notification said that CG Patwari Admit Card 2019 to the exam taking candidates will release on 13th March 2019. The CG Vyapam Patwari Exam Date is 17th March 2019. Those who are not informed about this 250 Patwari Vacancy Hall Ticket release date and exam date, verify them here. One of the competitive exams in the state is the Chhattisgarh Vyapam Patwari Examination 2019. Thousands of applicants are sincerely aiming to crack this exam. Those contenders should not forget to download your CG Patwari Admit Card 2019 since without this admit card you cannot write the exam. CG Patwari Admit Card OUT!!! 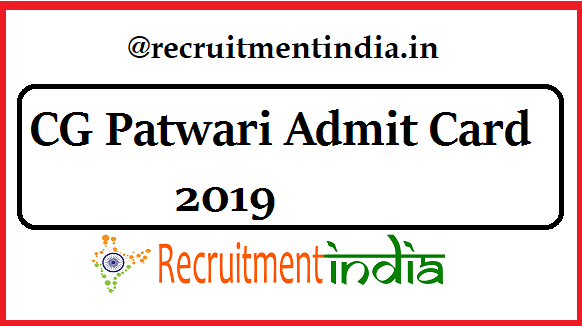 Latest Update (13th March 2019): CG Patwari Admit Card is released so candidates can download the links are provided below. Check now. Contenders through our recruitmentindia.in post, downloading of the CG Vyapam Patwari Admit Card 2019 is very easy. In just a matter of seconds, the applicants will attain their admit card. As per the schedule of the CG Vyapam Patwari Recruitment 2019, the higher authorities of the board proceed the action. So by considering the schedule the CG Patwari Admit Card 2019 is releasing on 13th March 2019. The exam date is 17th March 2019. 5 days earlier to the date of examination CG Vyapam commencing the link activation of the admit card. Hence exam holders who surely going to the CG Vyapam Examination on the recommended date have to download it first from the official page. Although if you know the exam date, the admit card is important for you. The verifying document at the examination center is the CG Patwari Admit Card 2019. Personally, this admit card is generated to all the contenders. So for one candidate generated admit card cannot be transferred to another person as the details may vary completely. CG Vyapam Patwari Admit Card download link will be triggered in the cgvyapam.choice.gov.in page only. Exam attending candidates have to know the main site where you are going to find out the link of your admit card. Another option for you to get your CG 250 Patwari Vacancy Hall Ticket is this page. Without undergoing many struggles to find the straight link of the admit card, you can find the link here at a single link. The CG Vyapam Patwari Syllabus reading candidates have to mark the deadline for the preparation. CG Patwari Exam Date is approaching neared. In the gap of one and a half month after the application last date the board organizing the exam on 17th March 2019. This immediate scheduling of the exam is due to the emergence of filling that vacancy. If the application status is accepted, then all those candidates have to mark the CG Vyapam 250 Patwari Vacancy Exam Date as 17th March 2019. Try to avoid the downloading of the admit card on the exam date because you may end up with the server problems so that is not possible to download the admit card. The recruitment board instructs some instructions in the CG Vyapam Patwari Hall Ticket for the convenience of the exam taking candidates. Adhering to all the instructions is the mandatory rule to the exam holders. Once after downloading the CG Patwari Hall Ticket from cgvyapam.choice.gov.in , you have to pursue the details like exam center, time of the exam and other details. The supporting staff in the exam hall will permit the competitors into the exam hall only after they have verified the CG Patwari Admit Card copy and the original id proof. The name, photo and signature in the hall ticket and id proof must be exactly similar, then only exam center staff will authorize you to the exam.